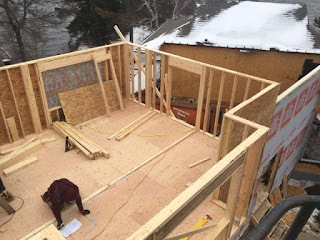 Black Fox Construction - Building lakeside homes and cottages that are beautiful inside and out in the Kenora Ontario, Lake of the Woods, Clearwater Bay, Falcon Lake, Minaki, Winnipeg River and Black Sturgeon Lake areas. With winter on the horizon, our crew racing to enclose our current projects in time for winter to enter its full swing. With a number of our projects wrapping up over the summer, we had the unique challenge of getting several new projects ready for a long winter of work. 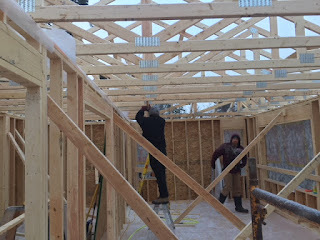 We've spoken before about the value of a ceiling, but from a perspective of a construction standpoint, the roof above it is far more important in the short term. Creating a sheltered and sealed workspace is important if you're planning on working through a Kenora winter. With the help of a ceiling, windows, and a few space heaters, our crew is ready for a full winter of transformation while our clients eagerly anticipate their new homes. 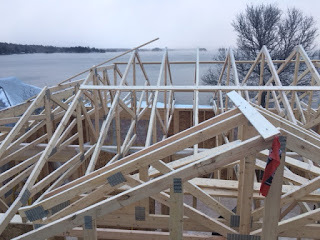 Have questions about Kenora builders, contractors, or interior cottage design? Please contact Bill Scurfield at bscurf@mymts.net or visit our website http://blackfoxconstruction.com/.